The toothbrush holder is one of the germiest spots in your home. If there’s a toilet nearby it’s even worse. Flushing sprays a plume of dirty water droplets into the air. To clean, run it through the dishwasher's high-temperature cycle or wash weekly in hot water and follow with a disinfecting wipe. 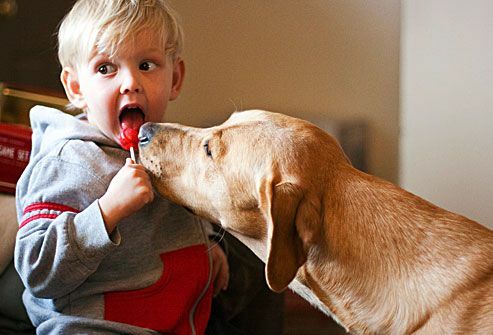 Pets and kids are natural besties. But Fido and Fluffy can transmit bacteria, viruses, and parasites to kids through their waste, saliva, or dander. Pet toys and bowls can be a source of coliform -- a family of bacteria that includes salmonella and E. coli. Kids should always wash their hands after touching pets or pet toys, dishes, or food. And, yes, avoid pet kisses. 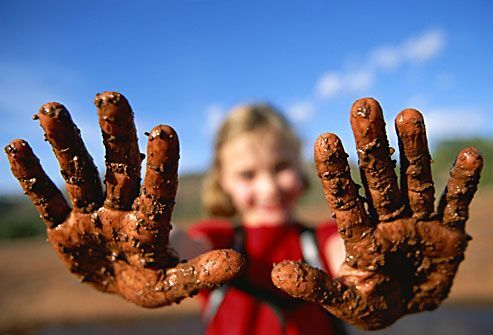 Yes the bacteria in dirt can be good for kids, experts say. But beware of some hazards. Don't let them play in a yard with animal droppings. Make sure your child's DTaP and Tdap booster vaccines are up to date so any cuts or scrapes don’t provide an opening for tetanus. 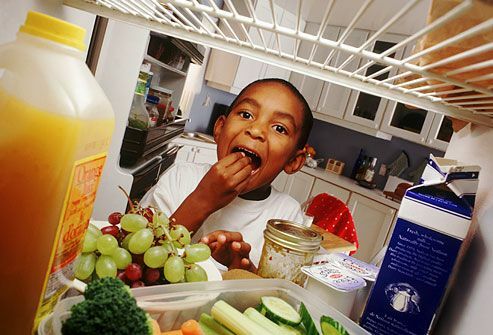 Open condiments, a leaky meat package, spoiled milk -- plenty of nasty things can await kids in the fridge. Salmonella, campylobacter, and norovirus, which can cause upset stomach and diarrhea, are common kitchen bacteria. To keep things safe, properly store food that goes bad easily. Wash and disinfect refrigerator walls and shelves. 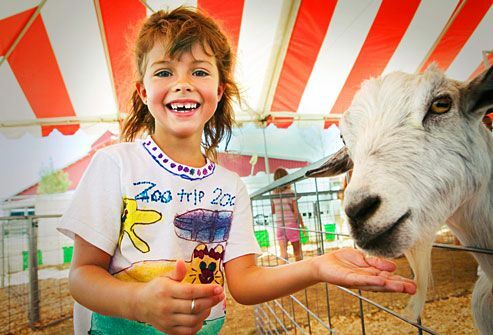 Petting zoos, educational farms, and school exhibits where kids can get close to animals are great places to learn. They’re also ideal spots for bacteria to spread. Young children are especially at risk. Don’t let kids take food, drinks, baby bottles, pacifiers, or toys into animal areas. Make sure they wash their hands after touching animals, too. 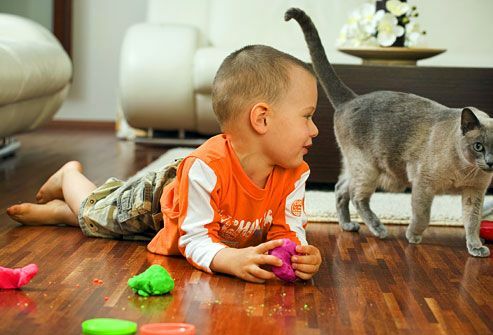 With food spills, grease, and human and pet traffic, kitchen floors can be filthy places to play. But other floors can be dirty, too. Carpet and hard floors are home to dust mites, mold, food particles, outside dirt, and even bits of insects. These can trigger allergies and asthma attacks. Fungi that cause athlete's foot and ringworm also can lurk at ground level. 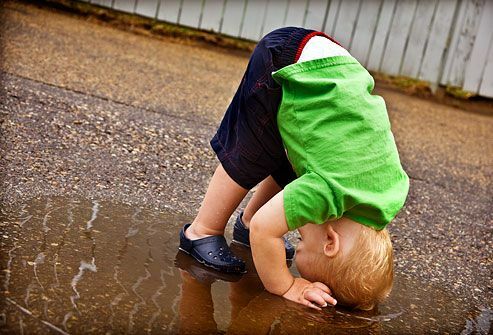 A pool of standing water is a tempting place to play, whether it's a pond, a bucket of rainwater under a leaky roof, or a puddle in a tire swing after a storm. It's also a breeding ground for mold, mildew, bacteria, and insects like mosquitoes, which can transmit West Nile virus and other diseases. 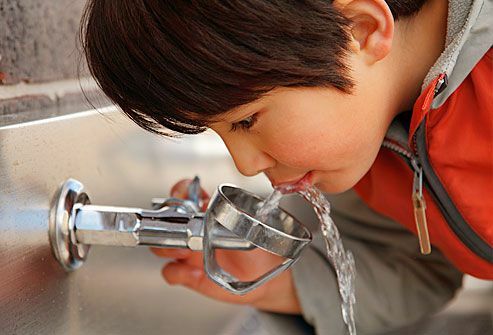 One study found more germs on classroom water fountains than on toilet seats. Plastic cafeteria trays were another hot spot. But researchers also say using hand sanitizer and disinfecting desktops daily cut grade-schoolers’ absences for illness in half. 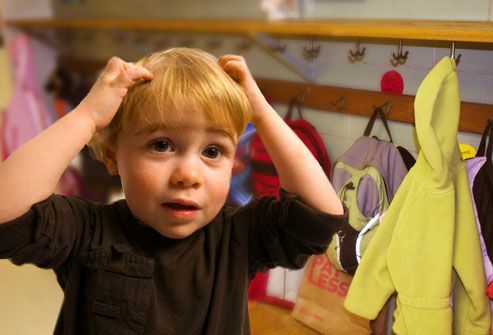 Children in school or day care are the most common carriers of head lice in the U.S. -- usually through head-to-head contact. It’s less common, but kids can also spread head lice by sharing hats, combs, brushes, or clothing. As a precaution, some schools assign cloakroom hooks and cubbies and have children store hats in their coat pockets or sleeves. Schools and day care centers, especially those with sports or playground facilities and equipment, are hot spots for the spread of bacteria like MRSA (methicillin-resistant Staphylococcus aureus). Staph bacteria enter your body through uncovered cuts and open wounds. Sharing towels and playing contact sports such as wrestling are other ways it spreads. Turns out the sandbox at your local park holds more than just sand. 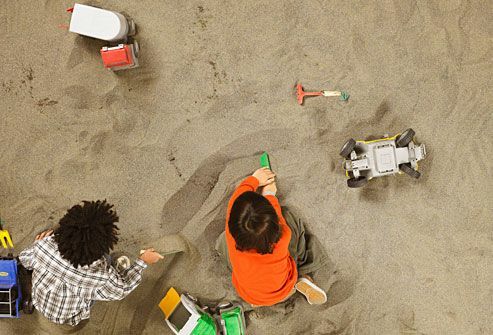 A 2010 study found sandboxes have the highest level of bacteria in the playground -- 7,440 per inch. They come from animals (like cats and raccoons) as well as human saliva, hands, food, and diapers. Not all germs are harmful, but when you have this many in one spot, some probably are. 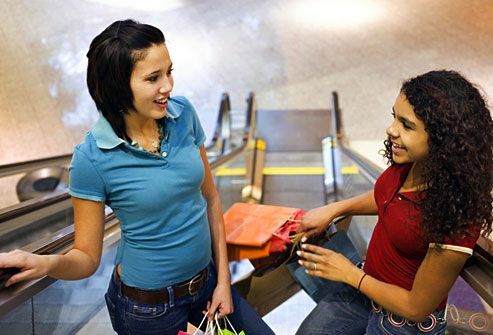 It's no surprise that all sorts of germs await kids at indoor malls, especially during cold and flu season. Studies show escalator rails, elevator buttons, video game controllers (think movie theaters and arcades), and ATMs are germ hot spots because they don’t get cleaned regularly. Washing hands can help, but scrub thoroughly. Public restroom sinks and faucets carry germs, too. From nose picking and wiping to nail biting, kids just do stuff that spreads germs. And most of them don't wash their hands as often or as well as they should. Yet hand washing is the first line of defense against the cold, flu, and other contagious illnesses. Encourage hand-washing before your kid handles food and after they use the bathroom, sneeze, cough or blow their nose. 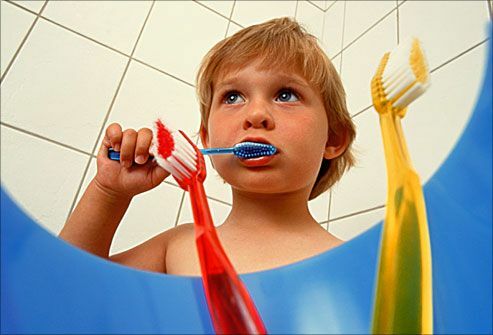 Teach children to use warm water and work up a good soapy lather. Scrub for about 20 seconds, rubbing between fingers, under nails, and over the backs of hands. Hand sanitizers with at least 60% alcohol are a good choice, but they don't remove visible dirt and can make your child sick if they swallow it. So use soap and water when you can. Cleaning countertops, floors, and other household surfaces with plain old soap and water can reduce visible dirt and germs. But disinfecting those surfaces with bleach or hydrogen peroxide solutions, for example, destroys germs. Most disinfectants work best when they can sit on a surface for at least a minute. You can buy commercial solutions or make them at home. A mix of no more than 1 cup of bleach in 1 gallon of water will kill many household germs. Rinse the surface after and let it air dry. 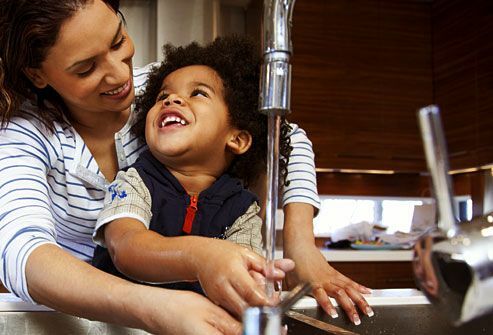 NSF International: "Top Ten Germiest Places in the Home," "Play Safer Fact Kit: Where Germs Are Lurking." NSF Scrub Club: "Kitchen Is 'Germiest' Place in the Home, According to Recent Study by NSF International," "NSF Scrub Club Germ Experiment Featured on Good Morning America." Nemours Foundation: "Infections That Pets Carry," "MRSA," "Why Is Hand Washing So Important?," "What's a Booger?," "What's Wrong With Biting My nails?" Natural Resources Defense Council: "Pets and Their Poop." National Foundation for Infectious Diseases: "Power of 10: Get the Dirt on Tetanus." Clark County Soil and Water Conservation District: "Kids and Conservation." University of Southern California Health Magazine: "Getting the Dirt on Germs." Colorado State Extension: "Cleaning and Sanitizing the Kitchen." American Dietetic Association: "Food Storage." CDC: "Compendium of Measures to Prevent Disease Associated With Animals in Public Settings, 2005," "Stay Healthy at Animal Exhibits This Summer!," "Head Lice," "Prevention of MRSA Infections in Athletic Facilities," "An Ounce of Prevention Keeps the Germs Away," "Handwashing: Clean Hands Save Lives," "Mold in the Environment." Alliance for Consumer Education Disease Prevention Program. Asthma and Allergy Foundation of America: "House Dust and Asthma." FamilyDoctor.org: "Asthma: Dust Mites in the Home." Environmental Protection Agency: "An Introduction to Indoor Air Quality." Fairfax County, Va.: "Eliminate Standing Water." American School and University: "Healthful Cleaning." Sandora, T. Pediatrics, June 1, 2008; vol 121(6): pp 1555-1562. Penn State College of Agricultural Science: "IPM for Head Lice in Schools." Cowlitz County Health Department: "Head Lice." Connecticut Department of Public Health: "MRSA Facts for Child Day Care Programs." Indiana State Department of Health: "Methicillin-resistant Staphylococcus aureus (MRSA) in Schools." University of Arizona News: "Germ Survey: Summary of Findings." Fankem, S. et al. Epidemiology, November 2006; vol 17(6): pp S457. Aronson, S. Managing Infectious Disease in Child Care and Schools, 2nd Edition, American Academy of Pediatrics, 2009.